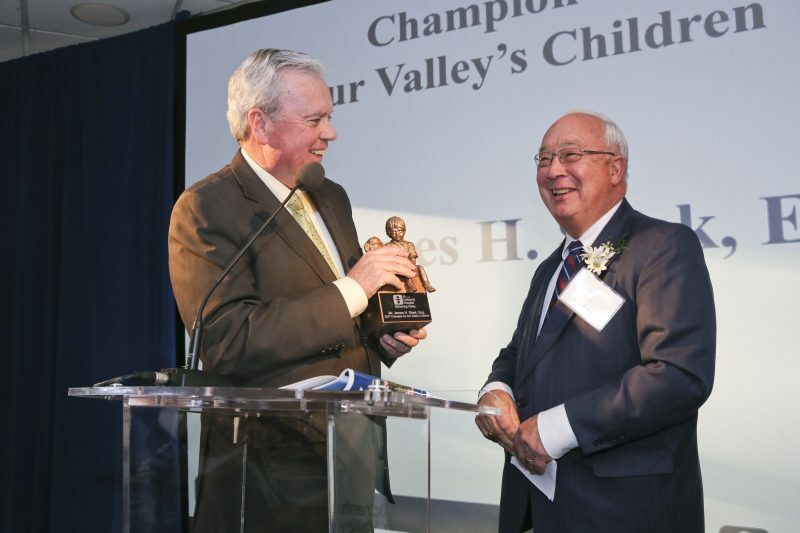 James H. Sisek, Esq., at right, is honored by Akron Children’s President and CEO Bill Considine at this year’s Champions for Our Valley’s Children Celebration Dinner. Mr. Sisek was recognized for his outstanding generosity and support of Akron Children’s. It was a night for celebrating champions, and James H. Sisek, Esq. was the star of the show. Akron Children’s Hospital Mahoning Valley honored Sisek for his years of advocacy and philanthropy at the 2017 Champions for Our Valley’s Children event at The Lake Club in Poland. Sisek’s ongoing generosity and support for the hospital has led to millions of dollars in support for the hospital’s local programs and services. Sisek is a member of the Akron Children’s Hospital Foundation Board of Directors and serves on the Akron Children’s Hospital Mahoning Valley Community Leadership Council. The event also highlighted Akron Children’s progress in the Mahoning Valley and recognized those who helped make it possible, including donors, volunteers, staff and community partners. Since the opening of the Beeghly campus in Boardman in 2008, more than $20 million has been donated to support the hospital’s mission. “The purpose of this award is to recognize individuals and organizations throughout the Mahoning Valley who exhibit the spirit of caring, and who are working to make a difference in the lives of the children in the communities we serve,” Stock said.